Purple Comfortflex M/L 27.5-32", used a bit, need to throw it through the wash. $20 shipped. 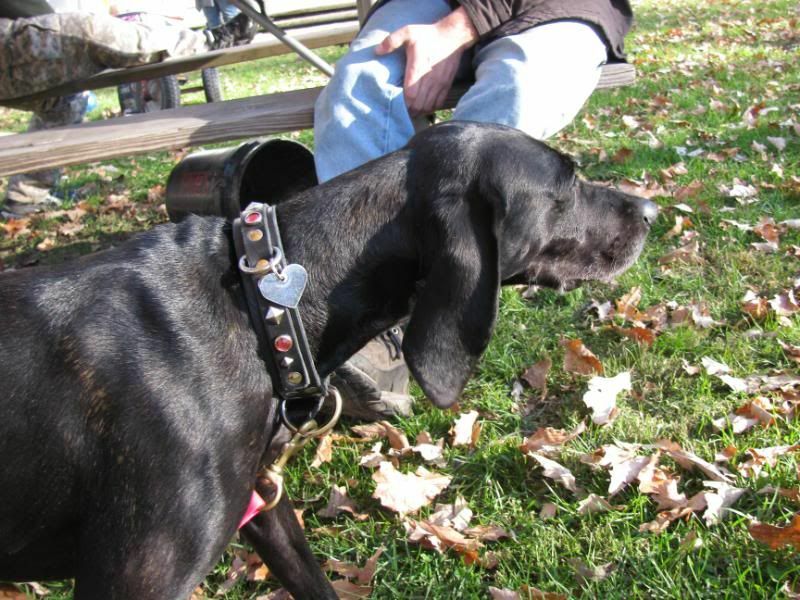 EzyDog Quickfit harness MD 21.5-26.5", also used a bit, chocolate brown (not black like the one pictured), $13 shipped. Not pictured: Kurgo Go-Tech Adventure harness, raspberry large 24-34", used with a bit of fraying from washing (aesthetic not structural), $15 shipped. Premier Sure-Fit harness, silver 3/4" Extra Small 15-21", good condition, $10 shipped. I think the girth measurement is off. Based on Clean Run's website, the 20" should fit a 26-28. The chest strap seems snug on Hudson and he'll hit 26.5" chest if he takes a deep breath. It has been worn a few times, maybe a dozen, in the last year. This coat has been to many exotic places, such as Mount Vernon and West Virginia. As an added precaution, if you put this on your dog and wear sun glasses because it is a bright, sunny day, John Q. 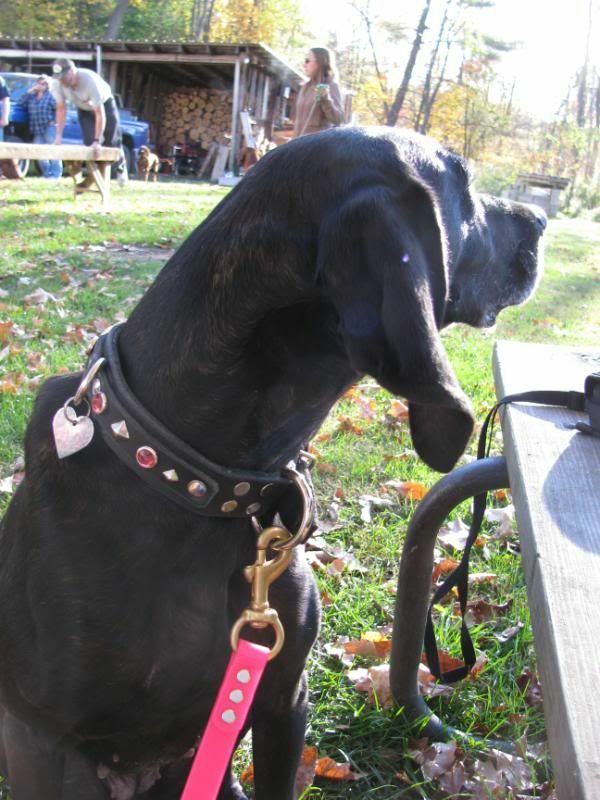 Public seems to think your dog is a service dog. It's a very odd experience, so I recommend only allowing your dog to wear it around intelligent people. It will be freshly washed before shipping. I'm thinking $20 shipped, but feel free to make an offer. I bought it last year for around $30. 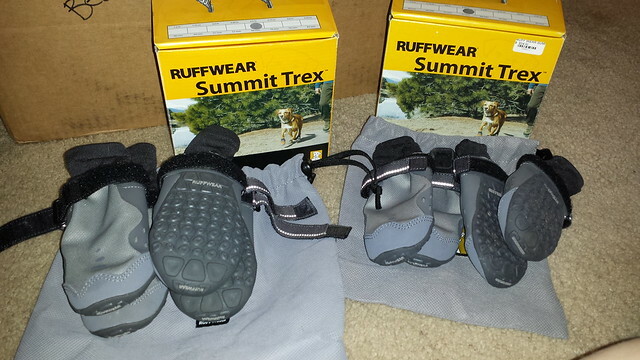 I have 2 sets of Ruffwear Summit Trex boots that I don't feel like packing and taking with when I move! I have a 2.25" set and a 2.5" set. They were only worn once, and then I realized I don't feel like putting boots on 2 dogs. They retail on Ruffwear's website for $60. I'm thinking $45 shipped for each set. Will be washed. Chances are they aren't That was posted 3 1/2 years ago. 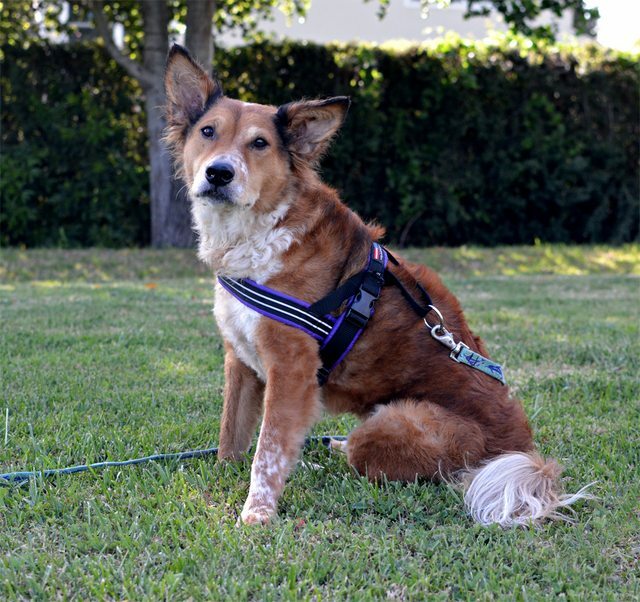 I still have a medium sized blaze orange Ezy Dog chest pate harness. Name your price. Purple and Green - 1.5", Crypton Martingale, opens to 22"
Leopard Minky - 1.5", No buckle slide, opens to 20"
Patriotic - 1", brass hardware, holes 15.5"-18", practically brand new. Purchased in March, worn maybe twice. Everything will be washed before being mailed. I can get better pictures tomorrow. Can combine shipping. Bumping up this thread again. Have a few things. Ruffwear Front Range, blue, XXS girth 13-17". Purchased from a member here for Lola, my moms dog, but it doesn't fit her that well. Think she is bigger than I thought and needs size up. Great condition. $22 shipped. Paco "The George" with magic buckle. 11-13" The George collar, 1" wide tapered, black leather, silver hardware w/ Magic Buckle. I love the collar and it kind of pains me to do this but I honestly just have too many again LOL. Need to downsize and this is the one that gets worn the least. It's honestly only been worn like 3x, mostly inside. So in brand new condition basically. Worth $112 w/ shipping from Paco. I'm selling for $90 shipped. So you're saving $22 on a basically brand new collar. Naturally your gorgeous Paco collar is 2" too big for one of my dogs, and 2" too small for another. Well a hole can always be punched in it if needed LOL but I know what you mean. Jackson's an odd size so I never find things second hand for sale that are his size. Willing to part w/ it for $85 but no less. 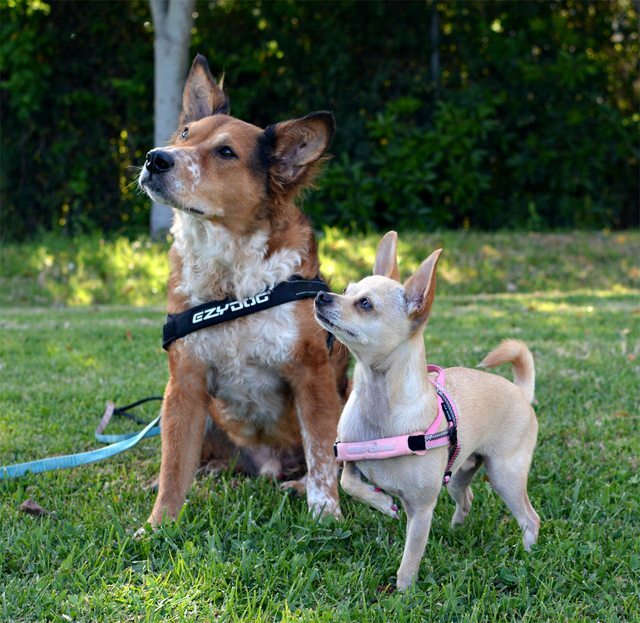 I have two ruffwear beacons I'll part with for $30 shipped. Packaging is a little beat up but they're brand new. Julee, one question about those beacons. 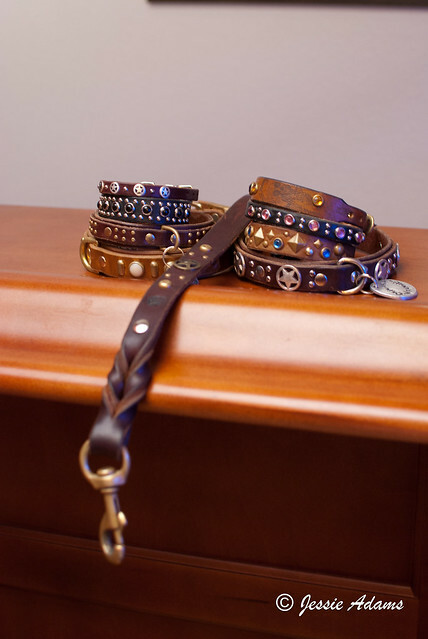 How do they compare to a LED dog collar? and how long do the batteries last? I found these LED dog collars, any thoughts? She hasn't worn it much, and I'll clean it up before I send it out. Selling because, well, she doesn't wear it much and my husband has brought to my attention how ridiculous my collar-hoarding has gotten. Guess that's too big your pet.